Episode 69 - Bhisma is out of commission, and his book is nearly over. In one last scene, Karna comes to meet his fallen nemesis. Bhisma is quite affectionate toward his prodigal nephew, and he tells him that he was only pretending to be antagonistic. He really didn't mean it, he just wanted to discourage Karna from enabling Duryodhana's evil ways. Bhisma begs Karna to forget his grievances and to join with his brothers and end the war this moment. But Karna is too far gone. He owes Duryodhana too much, and he has nursed his grievances for far too long to ever reconcile with the Pandavas. 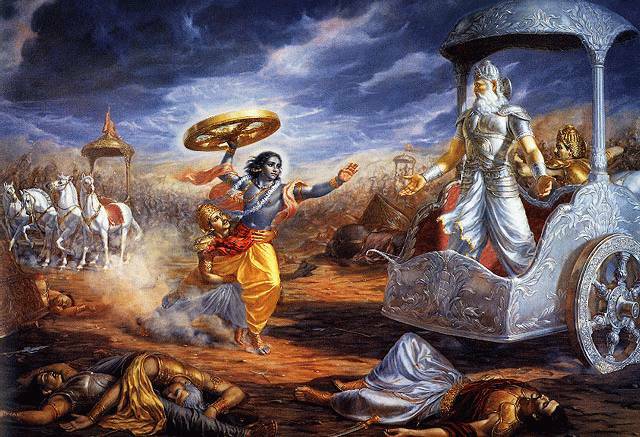 It is better that he exit this world in the most honorable manner possible-- on the field of battle, at the loving hands of his famous brother, Arjuna. This scene ends the Bhisma Parva, and we pick up the story the next morning, in the Drona Parva. Drona is made commander of the Kaurava army, and their strategy is to kidnap Yuddistira. If they get him, then they could force him to gamble and send the Pandavas back to the forest. But Arjun presents a major problem with this plan. After one fruitless day of battle, the Kauravas decide to distract Arjun with a suicide squad. The entire army of the Trigartas volunteer to go to their deaths in order to keep Arjun away from protecting his brother. On day 12, they almost pull it off, sacrificing the lives of one half their numbers, but Arjuna is too much for them, and he breaks away just when it seemed Yuddistira would be taken. Now, at the end of day 12, there is still another half of the suicidal Trigartas, so a final attempt will be made on grabbing Yuddistira on day 13. 13 is an unlucky number, and someone will have to pay for Yuddistira's freedom!